Sen. Kirsten Gillibrand (D., N.Y.) said in a new interview she hopes liberal Supreme Court Justice Ruth Bader Ginsburg "lives another 10 years" and continues to serve. 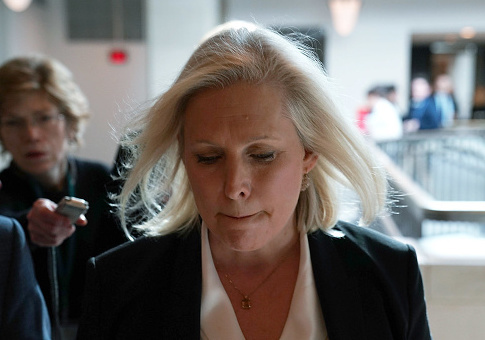 Speaking with Cosmopolitan about the recent nomination by President Donald Trump of Brett Kavanaugh to the Supreme Court, Gillibrand said she didn't feel Ginsburg or Justice Stephen Breyer should have retired while Barack Obama was in office. "I think Justice Ginsburg and Justice Breyer have done extraordinary work as Supreme Court justices," she said. "I think Justice Ginsburg is one of our greatest justices ever—the way she writes decisions, the way she can persuade her colleagues is extraordinary. I hope she lives another ten years and continues to serve on the Supreme Court." At age 85, Ginsburg is the oldest justice on the Supreme Court. She is almost certain not to retire while Trump remains in office so as not to let a Republican she has publicly criticized nominate a replacement who would hold an opposing interpretation of the Constitution. Gillibrand signaled long before Kavanaugh was announced that she would oppose any pick made by Trump. She said last month that the upcoming fight over the replacement of retiring Justice Anthony Kennedy was about whether the United States would "criminalize women." She has since said Kavanaugh could put women's lives at risk. This entry was posted in Politics and tagged Brett Kavanaugh, Kirsten Gillibrand, President Trump, Ruth Bader Ginsburg, Supreme Court. Bookmark the permalink.